88 Gordon Street, Glasgow. G1 3RP. To find out the history of the Corn Exchange click here. Why should London have the best pubs? 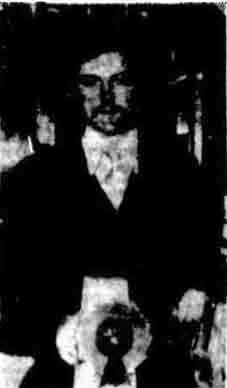 asked young Paul McBeth, newly appointed manager of the newly redecorated Corn Exchange in Glasgow’s Gordon Street. A good question. And there will be some people who are sure there are pubs in Glasgow every bit as good as those in London. But Paul, and his brother Michael, who is deputy manager of this Drybrough pub are determined to make sure that “their” pub will knock spots off all comers. Fired by the enthusiasm of youth, they want to see the Corn Exchange capturing even more business than before, and that’s going some! For many years the Corn Exchange has attracted businessmen from all walks of life. It first appeared opposite the Gordon Street entrance to Central Station way back in 1890 when it was owned by Messrs Cockburn and Campbell and operated as a wine shop. In 1899 it got its first restaurant licence and became the property of Glaswegians White and Smith, who were well-known restaurateurs in the city. In 1918 it first got the Corn Exchange label. 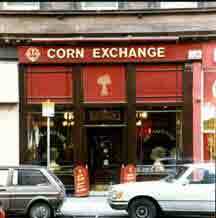 The name came from the original corn exchange which from 1841 to 1930 was situated on the Waterloo Street/ Hope Street corner. 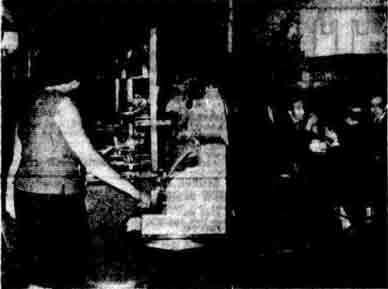 The pub was a favourite meeting place of lawyers, stockbrokers, and businessmen. The old place lost its name briefly when it was taken over in 1959 by John Scott, who called it, appropriately Scott’s Bar. But in 1961 when it became a Drybrough house, it reverted to its old name. Today the Corn Exchange consists of a lounge, a cocktail bar, and a function room. It has all been redecorated and food is far more in evidence than ever before. There are two serveries, one for cold food and one for hot. Visitors can have anything from a pint to a full-scale meal. The food ranges from a salad roll at 8p to a meal at £1 or more. There’s a set price for a hot meal, 35p, with a selection including braised steak, mince, fish, and beef olives. And there’s a basic price for a salad, 25p, which includes either gammon, beef, pork, egg, prawns, or chicken, with lettuce and tomato. There are also numerous “extras” available. There are more than 30 different brands of whisky on the gantry. The interesting history of the Corn Exchange is to be included in a cocktail booklet at present being printed. And customers who have favourite old family cocktail recipes are invited to volunteer their secrets for possible inclusion in the list. One of the features of the redecorated bar are murals of old Glasgow, painted by local artist Tom McLean. They include Stockwell Street Bridge, the Fiddlers’ Close in High Street, and Glasgow Cathedral. The Corn Exchange has always been a popular place by all accounts. And with the young McBeth brothers at the helm it looks like staying among the frontrunners in Glasgow. Also read how the Corn Exchange was refused an all-day licence. Read More On Glasgow’s Old Restaurant’s.